“Stay home when you’re sick” was the key public health message during the 2009 H1N1 pandemic, raising public awareness of the responsibility we all share in preventing the spread of contagious disease. The outbreak also highlighted how difficult it is for individuals without paid sick leave to meet competing obligations to their families, employers, their own well-being, and public health. Paid time off from work to recover from illness, tend to a sick child, or see a doctor is a prerequisite for healthy workers and businesses, public health, family economic security, and even children’s success in school. Yet four in ten workers get no paid sick leave – including many restaurant, grocery, and health care workers who are on the front lines of food safety and public health. 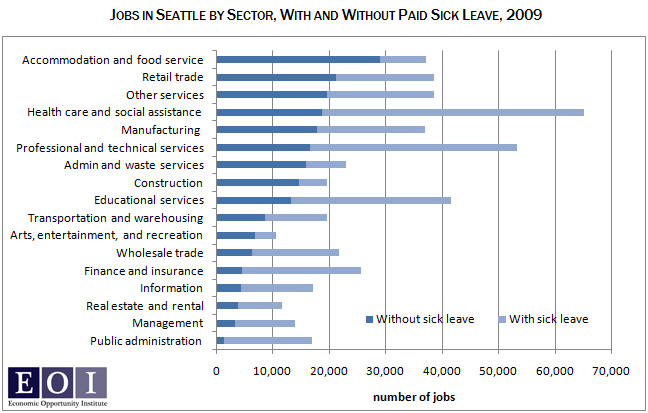 Seattle is home to about half a million jobs. An estimated 190,000 of those jobs do not offer paid sick leave, including nearly 30,000 in accommodation and food service, 20,000 in retail, and close to 20,000 in health services. Minimum standards of paid sick days have been passed in three U.S. cities and are under consideration across the country. San Francisco’s paid sick leave ordinance has been in place the longest, since February 2007. The research there shows the new standards are supported by two-thirds of employers and have produced real benefits for half of all workers. Since it was enacted, San Francisco’s job market has been stronger than in the state of California as a whole, and compares favorably with the surrounding counties. Adopting such a standard in the city of Seattle would protect public and community health, both in the city and throughout the region where Seattle’s workforce lives. This entry was posted in Business productivity, Healthy workers, Paid sick days and tagged business, health, Paid sick days, paid sick leave. Bookmark the permalink.